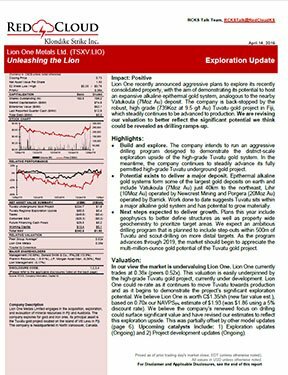 April 8, 2019, North Vancouver, BC – Lion One Metals Limited (TSX-V: LIO) (OTCQX: LOMLF) (ASX:LLO) (“Lion One” or the “Company”) is pleased to announce that its recently appointed technical advisor, Quinton Hennigh and its geology team, have undertaken a thorough evaluation of its 100% controlled Tuvatu high-grade gold deposit and adjacent tenure within the Navilawa caldera, Viti Levu, Fiji and developed aggressive plans to explore the full extent of this very large gold system. Demonstrable connection to alkaline magmatism, both volcanic and plutonic. Large, often nebulous alteration systems dominated by potassium enrichment. General scarcity of silica within the alteration assemblage and in veins. While quartz is often present, veins are often dominated by potassium feldspar and carbonate minerals. Overall low abundance of sulfide minerals. A large vertical profile, often in excess of 1,000 m.
Gold deposition driven by fluid phase separation, hydrothermal “flashing,” cooling and fluid mixing. “Veins” that are commonly comprised of interconnected narrow veinlets. Individual veinlets commonly display extremely high gold grades such that a few small veinlets can carry economic mineralization over mineable widths. “Spider web” like networks of veins sometimes displaying a feeder structure at their core. Multiple mineralized centers within the great gold system. Gold occurring as native gold, gold tellurides, gold-bearing pyrite. Enrichment in elements including As, Te, Mo, Zn, F and Bi. Ag-to-Au ratios generally 1-to-1 or less. Large gold endowment. Alkaline gold deposits are some of the largest gold deposits on earth. Examples include Cripple Creek (Colorado), Lihir and Porgera (PNG), Macassa (Ontario) and Vatukoula (Fiji). In late 2017, Lion One was informed it had won the tender process for the remainder of the Navilawa caldera, a large alkaline magmatic complex measuring approximately 7 km in diameter and situated approximately 40 km southwest of the large Vatukoula alkaline gold complex. In order to fully define the extent of gold mineralization at Navilawa, Lion One plans to undertake specialized stream sediment sampling using a technique called bulk leach extractable gold (“BLEG”) over the entire concession area. BLEG sampling produces highly sensitive results that can help define and prioritize mineralized areas. Work will commence after the rainy season has concluded. Results will help guide further prospecting and target identification. To better define the underlying structural controls that hosts the high-grade vein network in the Navilawa caldera, an initial CSAMT (controlled-source audio-frequency magnetotellurics) program will be undertaken. CSAMT is the lead targeting tool utilized in other world class alkaline systems such as at Cripple Creek, Colorado, where it is used to identify mineralized structural zones to depths of up to 1,000m. Lion One also plans to collect closed-spaced gravity measurements to help elucidate structural controls. Geophysical surveys can commence following the rainy season. CSAMT and gravity surveys will help identify potentially mineralized structures to enable Lion One to better target future drill holes. Lion One team of geologists will continue their ongoing prospecting and mapping program while the BLEG sampling and geophysical programs are underway. Numerous areas where historic high-grade rock chip samples have been collected are ready for immediate follow-up rock chip sampling. Return of BLEG results is expected to generate further areas for follow-up prospecting. Lion One’s immediate goal is to generate a pipeline of new drill targets. Large step-out drilling around the known Tuvatu high-grade vein system: The vein network at Tuvatu remains open in all directions and at depth. At least six areas, all within 500 m of the existing resource, and all situated within the Company’s existing mining license appear to potentially host significant extensions of this important vein network. Once structural controls have been better-defined by CSAMT, Lion One plans to develop a large step-out drill program beyond Tuvatu in order to demonstrate this deposit is significantly larger than currently perceived. New targets within the Navilawa caldera complex: Multiple untested mineralized areas are readily evident from historic soil and rock chip sampling. Most of these need further refinement through CSAMT, prospecting and mapping. Lion One believes BLEG sampling will generate further new targets to add to this long list. The Company envisions generating an inventory of at least 10 new drill targets by the latter half of 2019. Drill testing new targets will be critical to demonstrating multi-million ounce potential at Navilawa. Stephen Mann P. Geo, Managing Director, is a “Qualified Person” as such term is defined in National Instrument 43-101 and has reviewed and approved the scientific and technical information included in this News Release. Lion One Metals Limited is a Canadian exploration and development company focused on advancing its 100% owned and fully permitted Tuvatu Gold Project towards production. 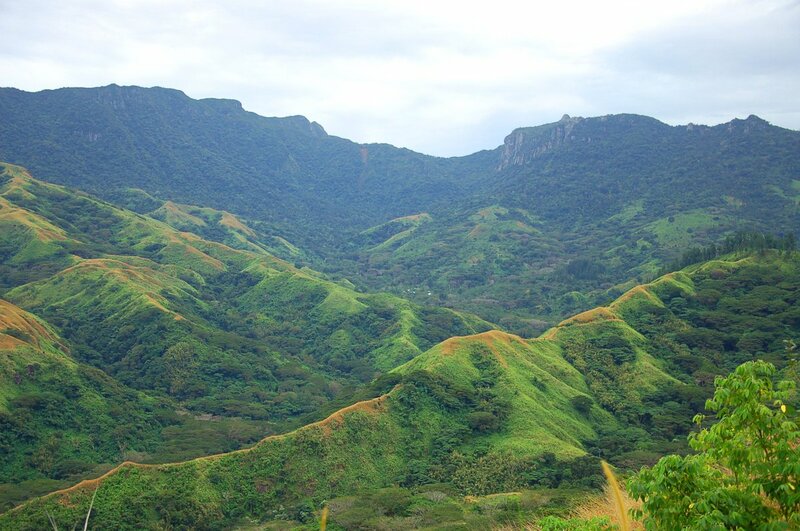 Lion One envisions a low-cost high grade underground gold mining operation at Tuvatu coupled with district-scale exploration upside of the adjoining Navilawa Caldera, located near the Nadi International Airport on the island of Viti Levu in the South Pacific island nation of Fiji. This press release may contain “forward-looking information” within the meaning of applicable Canadian securities legislation. All statements, other than statements of historical fact, included herein are forward looking information. Generally, forward-looking information may be identified by the use of forward-looking terminology such as “plans”, “expects” or “does not expect”, “proposed”, “is expected”, “budget”, “scheduled”, “estimates”, “forecasts”, “intends”, “anticipates” or “does not anticipate”, or “believes”, or variations of such words and phrases, or by the use of words or phrases which state that certain actions, events or results may, could, would, or might occur or be achieved. This forward-looking information reflects Lion One Metals Limited’s current beliefs and is based on information currently available to Lion One Metals Limited and on assumptions Lion One Metals Limited believes are reasonable. These assumptions include, but are not limited to, the actual results of exploration projects being equivalent to or better than estimated results in technical reports, assessment reports, and other geological reports or prior exploration results. Forward-looking information is subject to known and unknown risks, uncertainties and other factors that may cause the actual results, level of activity, performance or achievements of Lion One Metals Limited or its subsidiaries to be materially different from those expressed or implied by such forward-looking information. Such risks and other factors may include, but are not limited to: the early stage development of Lion One Metals Limited, general business, economic, competitive, political and social uncertainties; the actual results of current research and development or operational activities; competition; uncertainty as to patent applications and intellectual property rights; product liability and lack of insurance; delay or failure to receive board or regulatory approvals; changes in legislation, including environmental legislation, affecting mining, timing and availability of external financing on acceptable terms; not realizing on the potential benefits of technology; conclusions of economic evaluations; and lack of qualified, skilled labour or loss of key individuals. Although Lion One Metals Limited has attempted to identify important factors that could cause actual results to differ materially from those contained in forward-looking information, there may be other factors that cause results not to be as anticipated, estimated or intended. Accordingly, readers should not place undue reliance on forward-looking information. Lion One Metals Limited does not undertake to update any forward-looking information, except in accordance with applicable securities laws. Neither the TSX Venture Exchange nor its Regulation Service Provider accepts responsibility for the adequacy or accuracy of this release.